Federal and provincial Green Party leaders joined the Friends of Northumberland Strait in Pictou on Saturday, April 14, at an event to show their support for the #nopipe movement. Trappenberg and Roberts were joined by Green Party of Nova Scotia deputy leader Jessica Alexander, David Hachey, who ran in the Pictou riding for the Green Party of Canada, as well as Green Party of Nova Scotia executive members June Trenholm and Charlene Boyce. 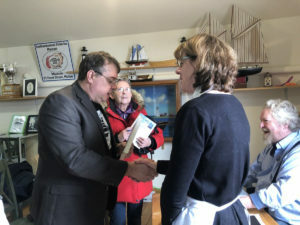 The #nopipe event featured a reading from The Mill by author Joan Baxter, along with a chowder tasting and lobster crafts for the kids, to underline the importance to local fishers of protecting the strait. 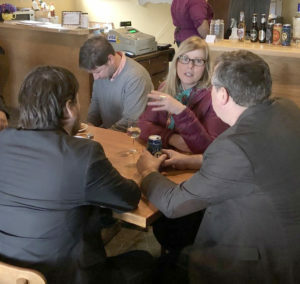 At a post-rally gathering at the Stone Soup Cafe, the group was joined by local Green Party members, No Pipe activists and Pictou West MLA Karla MacFarlane, who is the interim leader of the Progressive Conservative Party of Nova Scotia. A cordial and lively conversation followed. The Green Party of Nova Scotia aims to bring a similar event to Halifax in June, to keep extending the conversation on how to successfully transition from the kind of industry the mill currently represents to our greener future.